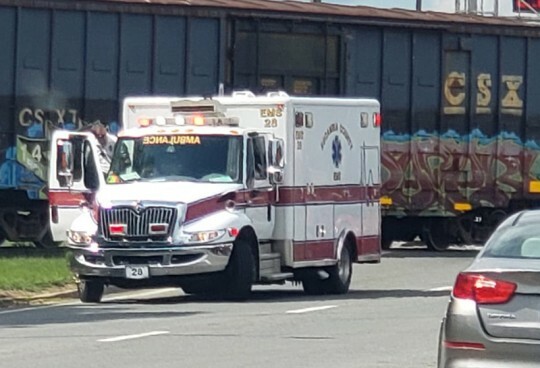 Trains blocking crossings for extended periods of time remains an issue in Escambia County , not only because it is an inconvenience but also a potential life safety issue when emergency vehicles are blocked or delayed. Local officials have a sit down meeting on the calendar with CSX, a county commissioner has floated the idea of code enforcement fines against the railroad, and one state representative has filed a bill to impose civil fines for blocked crossings. Florida Sen. Doug Broxson and Escambia County Commissioner Steven Barry will discuss the issue with CSX later this month and work on any possible local solutions. Trains blocking local roadways is quality of life issue, Barry has said, because people can spend 30 minutes or more each day waiting for a train blocking Highway 29 near Muscogee Road. And Barry said it’s an obviously a public safety issue when first responders are blocked from reaching citizens in need. One Cantonment neighborhood, east of Highway 95A from Countri Lane to McKenzie Road, has been completely cutoff for hours by a stopped train. 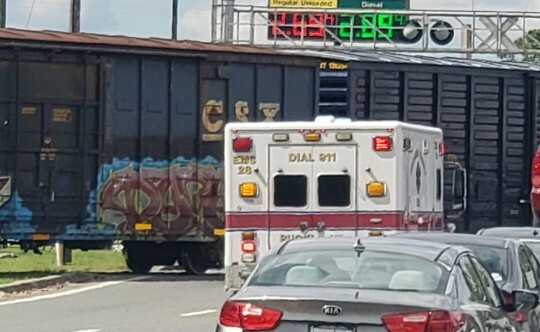 There are documented incidents where fire trucks and EMS units were unable to respond to medical emergencies in the neighborhood due to stopped trains. Barry said it might be possible for citizens to make complaints and Escambia County Code Enforcement issue citations to the railroad each time they block a crossing too long. Escambia County has had an ordinance on the books since 1994 that allows for a $500 fine and up to 60 days in jail when a train blocks a crossing for more than 15 minutes, except in the case of an emergency or mechanical failure. Penalties allow for fines of up to $500 and up to 60 days in jail for the “owner or person in charge” of the train. But enforcing that ordinance becomes difficult, according to county attorney Alison Rogers, because federal laws and protections for the railroads supersede local law. Florida Rep. Wyman Duggan (R-Duval) filed a bill this week that would impose civil penalties on a rail company that blocks a crossing for more than 15 minutes, unless the train is stopped due to a safety-related emergency or a mechanical failure that makes moving the train impossible. If a crossing is blocked, proposed fines under the House bill are $200 for 15 up to 20 minutes, $300 for 20 up to 30 minutes, $600 for 30 minutes up to an hour, and $1,200 for more than an hour plus an additional $1,000 for each additional 15 minutes beyond one hour. The bill generally allows the fines only for the railroad company, not employees acting on a supervisor’s orders. The House bill must go through committee, be approved by both the House and Senate before becoming law. If that happens, it would take effective July 1. Not the Railroad’s problem. They and their yards were there first. Moving a yard is impossible (think NIMBYs). It is the problem of the state to build an overpass. Maybe if they built more track on the IP side to “build” their train. Then they would only need to block 29 once going in and once coming out. Two words “CHEMICAL SPILL”. Look what is written on the sides of some of those tankers the Locomotive is pulling. in the event of an accidental spill most of the stuff in the tankers is deadly. Read what is on them and look it up yourself. WE NEED A WAY TO HANDLE THE TRAFFIC AND GET THE CHILDREN OUT. I have lived my life but they deserve it, as do the generations to come. There is a way to fix this situation, I know there are people who can design a workable solution. This is not just about the 30 or 45 minute’s we sit and wait. It’s about the future and those growing up behind us who depend on the grown-ups of 2019 to get it ALL done right. So, make IP pay for this….it’s their product. If they want it, find a way to get it out! This isn’t rocket science. When the railroad and IP get enough lawsuits filed against them by families that have lost loved ones because emergency personnel could not get thru, then they’ll look at it seriously. There’s a very easy solution to the daytime blocking of hwy 29. This train shares engines with a job that works Milton/pace area. The other job works nights. Switch job times. ie: other job works days Cantonment job works nights. Major traffic delays immediately averted. As for the other crossings majority of that is mechanical failure that wouldn’t be subject to the fines. Build an overpass for hwy 29 traffic. They’re building one on 9 mile for Navy Fed so they should just order 2 while they’re at it. Wow, just wow. This just shows how literally inept the county commissioners are. They have tried this before and it was a huge laughing stock. Not sure if they realize how utterly laughable this truely is. You cannot makke this stuff up! I have absolutely zero faith with these commissioners. What’s next, build a tunnel from Century to the beach? What have we come to? All the road construction, repairs they could have put a over pass fly over strictly for north and south bound traffic leaving local traffic for those who live work and plant entrance. That would take care of highway traffic. Hope the commissioner and state representative have a successful meeting and come to some conclusions that will help with this life safety and quality of life issues caused by the railroad. I realize many focus just on the crossing that goes into the paper mill but many of us live on side roads that have only one access in and out of our communities. Blocking access to these communities from Fire and EMS services could be a matter of life and death, not just inconvenience. One thing that would help with access for convenience would be if the railroad was made to maintain their right of way so vehicles could move parallel to the railroad track and get to a crossing that isn’t blocked. Of course this is not a solution for Fire and EMS to gain access given the size of their equipment but it would at least give those living in the communities and way in and out. The railroad maintained the rights of way years ago but they no longer do so. I am not opposed to a law that fines the railroad when they block roads for more than 15 minutes; however the law is of no value if the police and/or code enforcement don’t issue the citation or if those responsible for prosecuting the citation are unwilling to do so. My guess is that the railroad would just ignore the citation anyway and never pay the fine. The railroad is a 4000 lb elephant that goes and does what ever it pleases with little regard to anyone or anything else. IT’S SIMPLE AND ALREADY BEEN VOICED! RELOCATE THE FRICKIN SWITCH YARD! US 29/331 has been there since 1926. The plant wasn’t built until 1941. What happens in case of a DERAILMENT? Then what? How do you get thousands and more out if the DERAILMENT blocks say from Quinette down pass Muscogee Road but on the East side of the railroad those without four wheel drive vehicle’s don’t stand a chance. I was born in Cantonment I have watched this railroad get worse and worse, the wear and tear on people, their lives and homes needs to be fixed. But with something truly workable. Who decides who get the fines that’s a real laugh. If it had been being inforced we could have built a new cloverleaf ramp every where we need one now. I’m up in years now and have been blessed by God that when I have needed an ambulance it was able to get to me. But I have prayed I would not be like one time before with broke ribs and a punctured lung waiting for one of those blocked ambulances. Fines will not fix it. We need something viable for the entire mess. A fine will not give people back their or their love ones lives back. Before we changed to a” prey on me not for me culture” I never once read about a train blocking a railroad. a bridge for traffic is much cheaper than one that can hold the weight of a train. Lei’s be real! As an interim fix, electronic monitoring of crossings so EMS knows what crossings are blocked. Dispatch Lifeflight to blocked locations. CSX pays for it. Gesture of goodwill. Doesn’t help with fires, but better than nothing. Build a hospital on the old golf course property currently owned by the paper mill. Let the paper mill and csx flip the bill for the hospital since these two parties seem to be the cause of all of the delays. Install a life flight landing zone somewhere on the east side of 95A so that those residents can be picked up in case of a medical emergency. A hospital on the north side of the tracks along 29 will save the long commutes to in town hospitals and can be used when the tracks are blocked. Let’s “pretend”: the ECSO comes to enforce the ordinance on a train; The engineer is cuffed and hauled away. We are now left with no “driver” and CSX has to call the next rested and ready engineer. He will be an hour before arriving. What do “we” do in the meantime? The train is still blocking the roadway…..and the employees are bound by their own CSX set of regulations and union standards. Nothing has been accomplished. Consider all aspects for a workable solution before just rushing in and trying to affect change. Why don’t y’all just shut down the paper mill and railroad. Put a bunch of folks out of work and enjoy not stopping at the crossing! There are some pretty dumb solutions on here that are totally impossible! I live on one of these streets and it’s only been a problem for me a few times and can always make my way around the blocked crossing. It’s not a good situation and not an easy fix! @Concerned citizen: IP uses very little train freight since they started using long wood. IP is probably more inconvenienced/annoyed by the trains than we are. Besides, the problem is, and always has been, the switch yard and side rails which has nothing to do with IP. If the switch yard and side rails were moved to a remote location, say halfway to century or towards the Alabama line/Perdido, you wouldn’t have the train continually going back and forth over 29 to hook to lines of cars. Sure dont wanna hold up those ambulances on 29.. Lord knows all you no driving folks keep them busy daily! Mandate csx fund a 2 lane emergency vehicle only overpass at that location. Dispatch communications could have LEO on north and south sides to monitor it while the situation exist. If violators pass thru, their vehicle should be impounded for 30 days. Overpass rated for firetrucks, wreckers, and EMS vehicles . Train blocking Becks Lake Rd crossing as we speak. Been there for hours . Been there for hours. It’s simple, the County/State own and maintain Hwy 29. Rip up the Rial Road tracks and force International Paper to ship a receive all materials by tractor trailer. The amount of time that the train blocks Hwy 29 is inexcusable and a nuisance. I think it’s great that Sen. Broxon, and Commissioner Barry want to sit down with CSX and try to work out some solutions. At the same time, they need to be looking at things that are within their control to fix. Communities all over the country have already tried to take the railroads to court about the same issues, and lost. Congress has laws and regulations in place that leave regulation of the railroads solely up to the Federal Government, and rightfully so because if every community had authority over the railroads, they would not be able to operate. Our local government needs to focus it’s attention on overpasses and service roads. It’s a matter of priorities, they just found the money to put in an Interstate exchange and service roads for Navy Federal, but they can’t seem to find the money to do the same thing for everybody that uses Hwy 29 in Cantonment. Maybe the individuals that are stuck in an emergency with no ambulance or fire truck should start suing as well. Eventually, maybe, it will be enough. Having family and friends with health issues and who are elderly it is an active concern for me. There needs to be a way to get around them, whether it be them breaking the train so that the crossings are open or something else. I realize breaking the cars apart would be more hassle for the railroad employees but if it was their families lives possibly on the lines I’m sure they’d feel differently. The proposed fines may be a deterrent to a private individual under some other code, but the railroad companies are laughing at the proposed fines. They will be content to pay the fine rather than the operational inefficiencies incurred to move a freight train clear of a roadway. This bill initially seems like legislative action but is actually no more than meaningless bureaucracy. Add a zero to each of the proposed fines and then you may get the attention of the railroads. Laugh at the little fines. I would like to see this pass, but am afraid the railroads have more persuasion than our lawmakers in Tallahassee. As a long time Cantonment resident, I’ve sat through my share of trains. I have often worried about trains blocking emergency vehicles and as an older resident, that might be my emergency. Hopefully, both sides will be able to work something out.